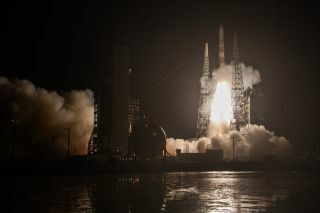 A U.S. Delta IV rocket lifts off. Donald Trump's plans to create a "Space Force" have ruffled plenty of feathers and alarmed some commentators. Some argue it will merely cause a bureaucratic headache. Raising greater concerns, others have argued the "Space Force" will cause an arms race in outer space. In the space policy community, however, the idea of a separate Space Force has been debated on and off for years. Trump's version – and this may come as a surprise – does not appear to be a dangerous move on its own. The US military's satellites are currently operated separately by the Army, Navy and Air Force; a Space Force would simply bring them under a single, separate command. The US military alone is already the world's single largest operator of satellites, with 159 – more than all Russia's military and non-military satellites combined. But while these military satellites are high-tech, they're not exactly the stuff of science fiction. Rather than carrying death rays and space marines, they are built to provide secure communications, early warning of a nuclear attack, reconnaissance, and precise navigation (among many other things). While the US military will not need any new satellites to set a Space Force up, it can't be done overnight by fiat. Congress must legislate, just as it did when the Air Force was split from the Army in 1947. The Department of Defense report that sparked much of the latest speculation confirms that existing space units within the Air Force – some of which were founded back in the 1960s – are being spun out into a US Space Command. Known as SPACECOM, this will be on an equal footing with the other "joint" commands upon which the US military as a whole relies and all of which have wide-ranging responsibilities. With nothing to indicate that new capabilities or major acquisitions are being pursued, this looks like a mere rebranding and reorganisation. Changing badges on uniforms and calling satellite operators "space warfighters" does not change the balance of power in Earth orbit. The US, China, and Russia have been developing space warfare capabilities for decades; they aren't rushing ahead, but incrementally developing a range of options to control or deny outer space in a time of open conflict, as they are sure to do at sea and in the air. Even the use of the phrase "space dominance" should not cause alarm. To say that the new Space Force could usher in an outer space arms race is premature and hyperbolic. Erroneous claims have been made by international lawyers (such as Steven Freeland) that a Space Force (and a goal of "space dominance") violates the Outer Space Treaty of 1967. In fact, the right to self defence is used to trump the principle of peaceful purposes in outer space, and is manifested in practice by the pursuit of space for military purposes by every advanced economy and military power on Earth. Whether the establishment of a US Space Force threatens peace in orbit comes down to how it plays into international threat perception. US leaders increasingly see Russia and China's anti-satellite capabilities as growing threats. To what extent Russian and Chinese leaders view US space technology as a threat is more difficult to prove, but their efforts to establish a UN treaty banning all weapons in space smack of an attempt to limit potential American superiority in orbit. A Soviet anti-satellite weapon strikes its target (artist’s impression). As this reorganisation of US military space is happening in the context of a chronic, rather than an acute, threat to American military capabilities, it begs the question of what problem Trump and his vice-president, Mike Pence, think they're solving. This is a demotion for the Air Force, which has fought tooth and nail against the Army and Navy since its inception in 1947 to become the lead military agent for space procurement and services. Whether the Air Force has somehow been a poor steward of American space power we may never know, since the point where the rubber meets the road in military space policy – the procurement and acquisition of orbital hardware – will never be publicly discussed. In addition, complaints that the Air Force has failed to nurture a "space power culture" remain too nebulous and emotive for legislators to grapple with.